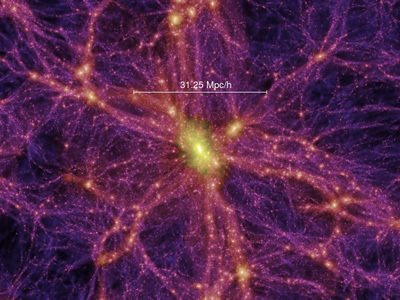 The Virgo consortium, an international group of astrophysicists from the UK, Germany, Japan, Canada and the USA released in June 02, 2005 the first results from the largest and most realistic simulation ever of the growth of cosmic structure and the formation of galaxies and quasars. In a paper published in Nature, the Virgo Consortium showed how comparing such simulated data to large observational surveys can reveal the physical processes underlying the build-up of real galaxies and black holes. 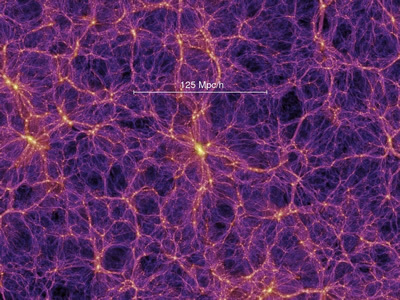 The "Millennium Simulation" employed more than 10 billion particles of matter to trace the evolution of the matter distribution in a cubic region of the Universe over 2 billion light-years on a side, in the largest ever model of the Universe. It kept the principal supercomputer at the Max Planck Society's Supercomputing Centre in Garching, Germany occupied for more than a month. By applying sophisticated modelling techniques to the 25 Terabytes (25 million Megabytes) of stored output, Virgo scientists are able to recreate evolutionary histories for the approximately 20 million galaxies, which populate this enormous volume, and for the supermassive black holes occasionally seen as quasars at their hearts. "It is the biggest thing we have ever done," said Carlos Frenk of the University of Durham. "It is probably the biggest thing ever in computational physics. For the first time we have a replica universe which looks just like the real one. So we can now for the first time begin to experiment with the universe. Funny you mentioned it. Check out this post from the New York Times, based on a slide I once presented in a conference. Itâ€™s referring to this project, previously featured in VC, that shows a mouse's neuronal network in different areas of the brain.